If I held an acorn in my hand and showed it to you, what would you see? I believe that depth of vision is a tremendous asset to possess. Surrounding yourself with others that possess great vision can also be invaluable. Some may look at the Acorn and see a simple seed. Other may look and see an immediate food source. Others may look deeper and see a “tree.” Others may look at it and be able to see an entire forest of trees! Others still will have the depth of vision to be able to see the uprising of a great city created from lumber produced by those trees! Many of us are not “born” with a great sense of vision. Here’s the upside. Depth of vision is a great business skill and like ALL business skills, it can be learned and developed over time and with practice. Do you have a multi-generational plan that begins by taking care of your family today? What does it look like? – Adequate pure death benefit focused life insurance. This protects your spouse or loved ones’ more immediate day to day living needs and can even stretch into the first future generation. – A minimum of 6-12 month safety net for living expenses kept in a highly liquid environment. – One to multiple CASH VALUE/CASH ACCUMULATION focused life insurance policy(s). This is also known as Infinite Banking or Bank of You strategy and it is an amazing current generation and many multiple future generations strategy. 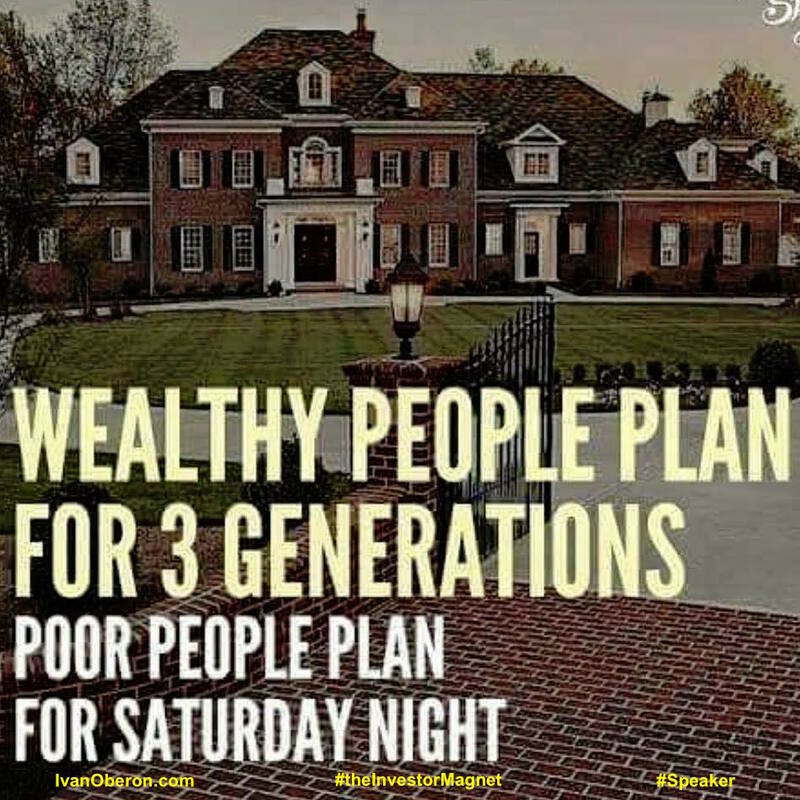 I cannot overemphasize how valuable this strategy is It is primarily the super wealthy that have educated themselves enough to employ this strategy and their generational wealth continues to explode. – SDIRA or Solo 401k if you are self employed. Also consider setting up a Roth IRA naming the appropriate beneficiaries. When you die, those beneficiaries of our Roth IRA will not only receive your account balance tax free, they will be able to invest that money and all gains are tax free FOREVER! The potential there is phenomenal even if they start off with a relatively small amount. – Structured short and long term investments in Real Property, Real Estate Notes and Trust Deeds and other Insurance instruments. – Precious Metals primarily as a hedge. Please understand that the most important aspect of this plan is EDUCATION. You must first educate yourself properly on these methods and THEN you MUST educate your beneficiaries and future generations. What good is your infinite banking strategy for creating generational wealth if you do not educate your children and beneficiaries how to set up their own with the death benefit settlements they will receive, tax free by the way. The right vehicles combined with the proper multi generational education make a powerful recipe for huge multi generational wealth and security.